First of all, I've been having a great time reading all of your comments on how you save time when cooking - keep the suggestions coming!! Now onto the food. I'm a big fan of casseroles because there's something magical and comforting about combining a bunch of ingredients in a pan, letting them blend together in the oven for a while, and pulling out a wonderful meal. I also love that I can clean up all of my prep dishes or get work done while it's cooking. I found this recipe in February's cookbook of the month, The Complete Whole Grains Cookbook, and it stood out because I loved the idea of using millet as a casserole topping. The bottom of this casserole was very tasty, a spicy combination of chicken and veggies in a thickened sauce. The crust was definitely the element that took this to a new level, though. The millet layer was thick, slightly crispy, and just cheesy enough to give it an extra boost of flavor and hold it together. I have very mixed feelings about this cookbook. I started out the month making a gluten-free pizza crust that was only ok, but some of the recipes were very good (including the tuna and red rice salad, crock pot millet and amaranth porridge, coconut chicken with quinoa, and this recipe). 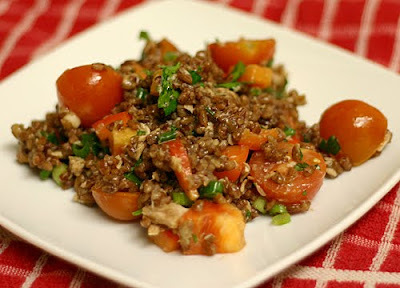 I had a lot of fun trying a new type of rice and finding a way to enjoy amaranth. Plus, I really appreciate alternate crock pot instructions for many of the recipes. Overall it's a very solid cookbook, but minor details bother me (typos in almost every recipe, ingredients that never show up in the directions, serving sizes that are way off). It doesn't compare to my favorite whole grains cookbook, Whole Grains Every Day, Every Way, but I'm glad that I've added it to my collection. Place millet in a medium saucepan and toast over medium heat, stirring frequently, until it starts popping (about 5 min). Remove pan from heat, add 3 cups water and salt, and return the pan to the stove. Cover the pan, reduce heat to low, and let simmer until all of the water is absorbed (about 20 min). Then stir in cheese and set aside. While millet is cooking, combine flour and cayenne pepper in a large bowl, add the chicken pieces, and stir well. Heat 1 Tbsp oil over medium heat in a large saute pan and add the chicken pieces, shaking off the excess flour (but don't discard the flour yet). Lightly brown the chicken on all sides, and then set it aside on a plate. Add the remaining Tbsp oil to the saute pan, and then add onion, celery, and bell peppers and cook until they're tender. Stir in chipotle pepper, garlic, lemon zest, chili powder, cumin, and oregano, and cook for an additional minute. Add 2 Tbsp of the excess flour, and stir well for 2 min. Pour in the remaining 2 cups of water, and continue to cook until the sauce thickens, stirring frequently (about 5 min). Add chicken back to the pan, stir well, and then pour the mixture into a lightly oiled 9 x 13" baking pan. 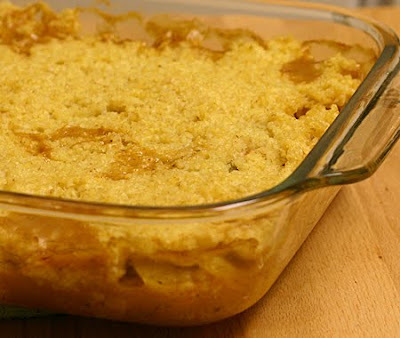 Spread the millet mixture on top and bake at 375 for 25-30 min, until top is lightly browned. Serves 6. It's time for another round of Adopt-a-Blogger, and this time I'm a veteran. Thanks to Kristen at Dine & Dish for organizing this event yet again!! I had a lot of fun learning from Julia, my mentor in the last round, and hopefully I can pass some of that info along (even though I still feel like there's an infinite amount for me to learn!). I had great plans of introducing my mentee, Anne at My Cooking Myself, by trying out one of her recipes this week. I've been drooling over her Tequila Lime Chicken, but unfortunately an allergic reaction* last Friday has caused me to be extremely careful about what I'm eating (including no alcohol and no citrus), so the recipe will have to wait a little while. In the meantime, go check out Anne's site and try out this recipe for me (or any of her others!). And if you have any advice for a relatively new blogger, feel free to leave a comment here or on Anne's blog. When my friends (most of whom are grad students or recent grads with stressful/busy jobs) find out that I cook all the time, they ask me one of two questions: 1) How do you have time? 2) How do you afford it? I struggle with both of these issues on a regular basis, but I'll share the strategies that I do use. I would love input from all of you so that we can give each other ideas. I'll tackle the time issue first, and I'll get to the money part in a separate post. I have to thank my friend Megan for prompting this series of posts, and she inquired not only about time for cooking, but also planning and shopping. I'll start off by saying that time is relative, and if you're doing something you like, it will be easier to "find the time" to do it. While not necessarily the easiest thing to do, if you find a way to enjoy planning, shopping, and cooking, you will look forward to it at the end of the day. I enjoy the science behind cooking (Yes, I'm a nerd. I embrace it. ), and I also love trying new combinations of ingredients and experimenting with new foods. That's one of the main reasons I love shopping and cooking, and why I spend a whole lot of time thinking about food, reading about food, making new dishes, and eating. It's fun for me. So that was a long winded way of saying that it helps to find a way that YOU enjoy it. It may be fun for you to cook with other people and view it as a team "sport," or maybe you would enjoy picking a new dish or cuisine to master, or perhaps you would like to challenge yourself to cook your way through a cookbook. Figure out what works for you and go with it. 1) I use my crock pot A LOT (particularly when I'm excessively busy). I like having medium (3.5 quart) and large (5.5 quart) crock pots so that I can cook smaller batches of food when it's just me or large amounts of food when I'm having people over or when I want to freeze some of the leftovers (more on that in a minute). Often you'll have to chop things or even brown meat before throwing everything in the crock pot, but you can do this at night, assemble everything in the crock, and stick it in the fridge (not the base). Then all you have to do in the morning is put the crock in the base and turn it on. And just about everything tastes better when it's been cooked all day. 2) My freezer is always stocked. I always have meat (usually raw chicken and ground beef/turkey/bison, as well as cooked, shredded chicken or turkey), cooked beans (I cook large batches of dried beans and freeze them in can-sized portions), cooked grains (typically brown rice, quinoa, and millet), fruit, veggies, corn tortillas, and nuts in the freezer. If you have these things on hand, it's really easy to throw together a healthy meal with veggies, grains, beans or meat, etc. In fact, Michelle at Find Your Balance had a great recent post about throwing together healthy meals from these very ingredients. 4) I love leftovers. I typically make 4-6 servings of most recipes, and I'm usually cooking for one. Then I have lunch for a few days, or dinner on days that I don't have time to cook. If you don't like eating the same meal twice in the same week, freeze it in serving-sized portions. Most things freeze fairly well, especially chili, pasta (I love frozen lasagna), soups, and casseroles. The only things that aren't freezer-friendly are milk and cream-based dishes. 5) Sometimes I cook a few basic ingredients that can be used in many ways throughout the week. For example, I'll have grilled chicken one night, then shred it and throw it into tortillas the next night, and make a stir fry later in the week. This works with many different foods, and feel free to get creative. 6) I cook a lot of food on the weekends. If I know I'll have a busy week, I'll cook 3 or 4 things on Sunday so that they're sitting there waiting for me on nights when I don't have time to cook. It gives me the satisfaction of making lots of new dishes, but conforms to my schedule. Or sometimes I'll do prep work on the weekends if I'm making dishes that require lots of chopping so that I can still cook but it doesn't take much time. 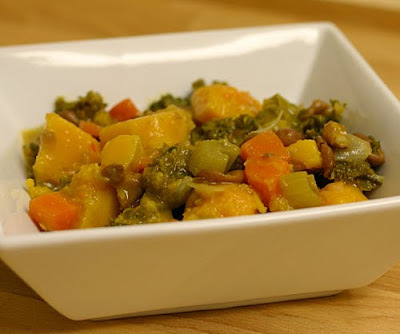 7) On busy nights, I often throw together casseroles or soups that don't need my attention. I love putting ingredients into a pan or a pot, sticking them in the oven or simmering them while I get work done, and coming back an hour later to a fabulous meal. 8) I figure out how much time I'll have to cook that week, and then make sure that I plan meals that will take less time. Inevitably you won't have as much time as you think you will (I think there's a mathematical proof out there somewhere). 9) Cooking through a cookbook (or blog) every month saves me a lot of time planning meals. At the beginning of the month, I make a list of all of the recipes that stand out and jot down their page numbers. Then each week I simply choose a few things off of the list, write down the ingredients, and I'm off to the store. I almost always make other recipes or create my own, too, but it's a great way to get to know a book and save time looking for meal ideas. 10) I do my best to avoid the masses at the store. Not only does it take me twice as long to shop, but I also have an anxiety attack when I go to Meijer (the Midwest equivalent of Super Walmart) on the weekend. If shopping is a horrible experience, you're going to resent the time you spend doing it (I'm counting the days until I'm near a Publix, where shopping truly is a pleasure). Whenever possible, I shop at farmers' markets, coops, or natural foods stores because people are generally more friendly, I don't have to fight my way down aisles, and it takes much less time (the downside is the cost, but we'll get to that next time). And if I need to go to Meijer, I go at weird times, like 2 am on a Tuesday (ok, usually not that weird, but it has happened once or twice). I'm planning to put together a list of quick meals (thanks for the idea Brian and Megan! ), but for now I'll leave you with my crock pot recipes. How do you find time to plan/shop/cook?? We would all love to hear your ideas because my approach might not work for everyone. Share away! I haven't cooked much quinoa since I fell in love with millet, but I do miss it. Millet and quinoa are roughly the same size and I often substitute one for the other, but they taste very different and I could never pick a favorite. I was thrilled to find this recipe in the cookbook of the month because it sounded like a great excuse to cook quinoa again. I had all of the ingredients on hand (well, not really, but I made it work anyway), and it was a fantastic dinner. It's not a Thai dish, but it has similar flavors, and I loved it. Heat oil over medium heat in a large saute pan. Add chicken to the pan and brown for a few minutes. Then flip it over, cover the pan, and cook for 5 more min. Remove the chicken from the pan and set aside. Add onion, garlic, and chipotle pepper to the pan and cook until the onion is tender. Then stir in curry powder, cumin, allspice, salt and pepper, and quinoa, and cook for a minute or so, stirring constantly. Add the water and coconut milk, bring to a boil, and place the chicken thighs on top of the quinoa. Cover the pan, reduce heat to low, and cook until chicken is no longer pink (about 20 min for boneless, skinless thighs). Serves 3. I'm weird when it comes to potato salad; I think that mustard is a necessity, while mayo is optional. Don't get me wrong, I have no problem with "classic" potato salad (as long as lots of yellow mustard is involved), and it's perfect for a summer picnic. At other times of year, though, I prefer a classier version with Dijon mustard and oil. This was probably the best one that I've ever made because the mustard didn't overwhelm the taste of the potatoes. It was also lighter than most potato salads, which I appreciated. I'm submitting this soup to Weekend Herb Blogging, which is organized by Haalo from Cook (almost) Anything At Least Once, and hosted by Chris from Mele Cotte this week. Cut potatoes into bite-sized chunks, add them to a large pot, and cover potatoes with water and a sprinkle of salt. Boil potatoes until they are soft (about 15-20 minutes, depending on the size of your chunks). Drain the potatoes and let them cool for about 10 min. Stir together mustard, oil, vinegar, honey, pepper flakes, and salt and pepper in a small bowl. 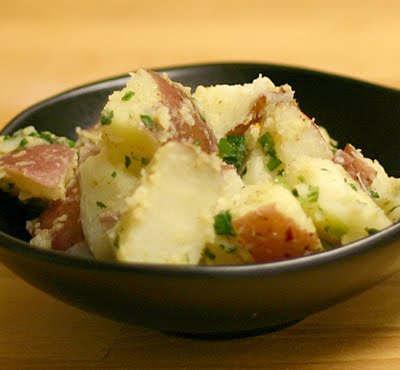 Add green onions and parsley, and then combine the dressing mixture and the potatoes in a large mixing bowl. Taste and add more of any of the dressing ingredients, if necessary. Serve warm, room temp, or cold. Serves 8. I must admit that amaranth didn't win me over the first time I tried it. When eaten on its own, it has a very strong corn flavor with a bit of grassiness mixed in. It also becomes thick and sticky while cooking. That being said, I was willing to give it another shot, and I liked the idea of mixing it with one of my favorite grains, millet. 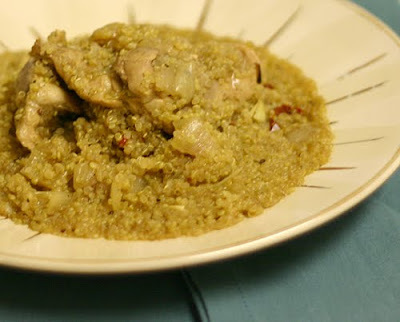 The addition of millet tamed the amaranth flavor, and I really enjoyed the combination. I often mix brown rice, steel-cut oats, millet, and quinoa in the crock pot, but this was a nice change from my usual breakfast. This recipe brings up one of my biggest complaints about this month's cookbook of the month: the number of servings is very high on most recipes. Recipes list nutritional information, and I'm guessing that there are lots of servings to reduce calories and fat per serving. I understand that, but if I had eaten 1/6th of this, like they suggested, I would have had about two spoonfuls. Typically I end up with more servings than recipes suggest, so it's been quite an adjustment with this book. Combine millet, amaranth, and water in a small crock pot. Place a towel over the top of the crock, and then set the lid on top. Cook on low for 7-8 hours. Add any of the optional ingredients when serving. Serves 2. 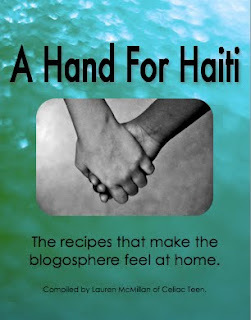 Wondering what you can do to help out in Haiti? Looking for some amazing recipes? I have your answer. Lauren at Celiac Teen has put together an amazing ebook of 87 recipes from some of my favorite food bloggers (and some new-to-me bloggers that I'm excited to discover!). The recipes are a collection of comfort foods, and I contributed my favorite lasagna recipe. Many of the recipes are gluten-free and many more can easily be converted. You can donate any amount that you want (at least $10 Canadian), and all funds will go to the Canadian Red Cross. The Canadian Government is matching all donations before February 12th (and Lauren's parents are also matching funds up to $1000), so go get yours now! When I was a teenager, I was too wrapped up in my own life to do anything remotely like this, so I'm truly amazed that Lauren had the idea for an ebook, made it happen, and did a fabulous job. The last two months, I've tried out fantastic cookbooks, so this month's book has big shoes to fill. I wanted The Complete Whole Grains Cookbook since the day I read about it almost a year ago, and luckily I won a copy of it (and 9 other books) when I received first prize in the Whole Grains Council photo contest in the fall. Immediately upon opening the book, I was excited to find that many of the recipes have alternate instructions for the crock pot (it finally hit me that the author, Judith Finlayson, has written numerous slow cooking cookbooks). Unfortunately the book and I got off to a rocky start. I tried the recipe for gluten-free pizza crust, and it had a really weird texture and was a bit tough (it wasn't horrible, just disappointing). However, this salad has redeemed the book for now. I always have a few cans of tuna in my pantry, but almost never eat it. Occasionally I'll have some if I'm desperate for a protein-packed post-workout snack, but I usually work out in the morning and the thought of eating tuna before noon is repulsive. I also have a bag of Bhutanese red rice hanging out in my pantry (right next to the tuna, by coincidence), so I was excited to find this salad that combines the two. The salad was really tasty, especially the next day when the flavors had blended. It's more of a summer salad, but I still enjoyed it. Place rice and water in a small saucepan and bring to a boil. Then cover, reduce heat, and simmer until rice is tender (about 25 min). While rice is cooking, combine tuna, bell pepper, green onions, tomatoes, and parsley in a large mixing bowl. In a separate small bowl, stir together vinegar, oil, mustard, garlic, salt, and pepper. When rice is cooked, let it cool for a few minutes and then stir it into the large mixing bowl. Pour dressing on top and mix well. Serves 4. I gave you a little break from soups, but I can't wait any longer to share the favorite soup from my soup extravaganza a couple of weeks ago. I wanted to make a veggie-based soup that would be a little bit lighter than the other soups that I made (red lentil stew, potato and leek, and Thai chicken), and I settled on Food Blogga's butternut squash, kale, and chickpea soup (substituting pinto beans because I was out of chickpeas). Before I tasted it, I was surprised to hear this soup get rave reviews. I thought people would get squeamish when they saw the kale, or that they would be iffy about the squash. Boy was I wrong! Everyone seemed to enjoy it, and overwhelmingly declared it their favorite. I knew why when I tasted it. It was sweet, spicy, and perfect. It became more of a stew by the time I took a picture (apparently I'm not very good at doling out the liquid portion of the soup), but it was still fantastic. I'm submitting this soup to Weekend Herb Blogging, which is organized by Haalo from Cook (almost) Anything At Least Once, and hosted by Simona from Briciole this week. Heat oil over medium heat in a large soup pot. Add onion, carrots, and celery, and saute until they begin to get tender (about 7 minutes). Add the crushed red pepper and cook for an additional minute. Stir in squash, beans, and stock, bring to a boil, reduce heat to medium-low, and simmer for 10 min (or until squash is tender). Add kale, cook for another 5 min, and then add parsley and basil. Season with salt and pepper and enjoy! Serves 6-8. As a kid, I never liked my foods to touch each other (who am I kidding, it's still true with some dishes), but I distinctly remember the first time that I tried grits and scrambled eggs together. My uncle convinced me to stir them up in one bowl, and I loved it. 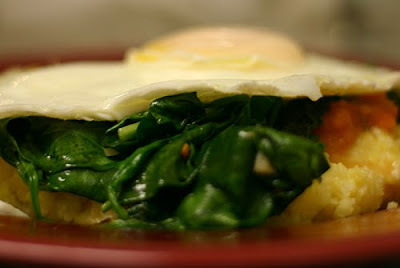 This is the grown-up version of grits and scrambled eggs - polenta with tomato sauce, sauteed spinach, and a fried egg. This was a simple meal that had sophisticated flavor (perfect for inviting people for dinner at the last minute). I found the basic recipe in January's cookbook of the month, but then added the book's basic tomato sauce recipe. I'm glad I made the addition - it was the perfect complement to the meal, plus it gave me a lot of tomato sauce for pasta later in the week. And it was one of the best tomato sauces that I've ever made thanks to the secret ingredient, cream cheese. Now that I've tried a handful of recipes from Moosewood Restaurant Cooking for Health, I can conclusively say that I love it. It surpasses the other Moosewood books, which is saying a lot. I appreciate that there's a lot of variety, including several gluten-free recipes. Everything that I tried turned out really well, and I'm having trouble picking my favorite, so I guess I'll just say that I loved the gluten-free apple and rice bran muffins, the dried fruit, nut, and coconut truffles, the eggplant, ricotta, and walnut pasta, the Mexican rice and pepper-stuffed portabellas, and this polenta recipe. It's tempting to stick with this book for another month, but I'll move on to another one. Don't be surprised if you see it popping up again soon, though. Bring the water and salt to a boil in a medium saucepan. Slowly whisk the grits into the water, reduce heat to low, and cook while whisking frequently until the polenta pulls away from the side of the pan (about 20 min). When it's done, add the butter and parmesan. While the polenta is cooking, heat 1 Tbsp oil over medium heat in a large skillet. Add the garlic and red pepper, and saute for a minute. Then add spinach, cover, and cook until it wilts (about 3 min). Just before serving, heat remaining 1 tsp oil in a large skillet over medium heat. Add eggs and cook until the whites are firm. Serve a few spoonfuls of polenta topped with tomato sauce (recipe below), if desired, and spinach and an egg. Serves 4. Heat the oil in a medium saucepan on medium heat. Add the onions and garlic, and cook until tender. Then add the carrots, bell pepper, salt, pepper, oregano, and wine. Cover and cook for about 10 minutes, stirring occasionally, until the vegetables are soft. Add the tomatoes, recover, and simmer for 10 min. Stir in the basil and cream cheese, puree in a blender or food processor, and season with additional salt and pepper if needed. Makes about 5 cups.